Some dogs simply deserve the title of #BestDogEver. We all have a dog that could wear that label, but Baby Joey deserves the title more than anything. Baby Joey was found as a puppy with nearly both of his rear paws chopped off: By an unspeakable monster. Instead of focusing on his nightmare past, Fidose of Reality is taking the lead from this pistol of a pooch: Forge ahead and don’t let the bad guys win! What his foster mom loves about the food is that Joey can’t get enough in, does not realize he is getting beneficial things like brown rice, peas, barley, and most importantly deboned chicken. The Merrick Classic Small Breed Recipe starts with real deboned chicken as the first ingredient for a 30 percent protein level. Why is protein important to a dog food? Growing bodies need more protein. Not all proteins in puppy food are created equally in protein level, so Merrick takes the guess work out of this important factor in selecting a dog food. Is it Easy on the Stomach? 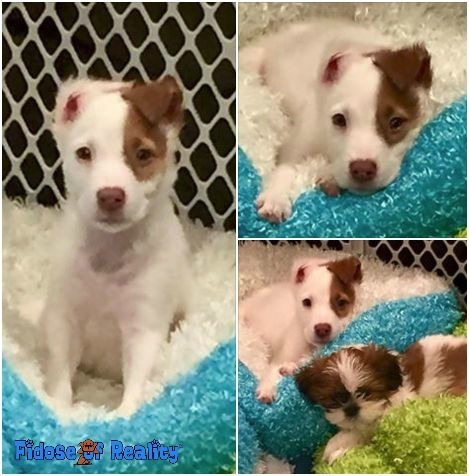 Baby Joey shares his home with many other dogs who are awaiting a forever place in someone’s heart. Every dog has different needs, just as every human being has different needs. As a dog mom who rotates protein sources in my dog’s food, having a food that is easy on the stomach is important. The fancy word for this is digestibility, which basically means it is easy for the digestive system to process.Merrick Classic recipes have been reformulated so that dogs not only like the flavor more but they are more digestible. 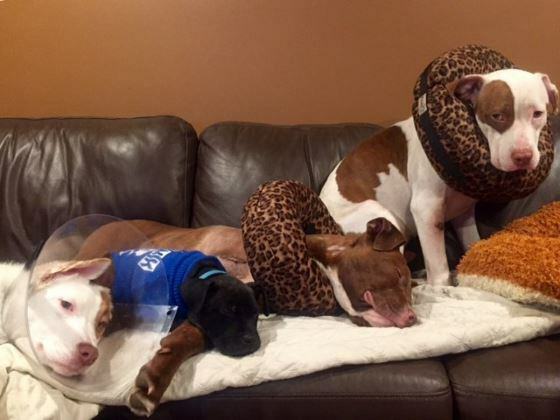 Baby Joey, far right, and some of his pack mates! Yes, these are the things that go through this dog mom’s mind. I wouldn’t want to eat the same flavor food day in, day out, and dogs likely feel the same way. Rotational feeding is all about variety and changing the protein source of your dog’s food from time to time. Dog parents need not rotate, but it’s nice to know there are options in the line if you choose this route. That works out to 30 percent protein for each meal your dog eats. Good stuff! What’s the Deal With Whole Grains? The year 2016 is a healthier one for myself and my family. We decided to take better care of ourselves as a couple, and that includes our dog. Since we enjoy quinoa in our salads and as a side dish, it warms our dog-loving hearts to see quinoa in these recipes. An incredibly healthy staple food, this whole grain has a lot of benefits for dogs, including Baby Joey. But What About a Grain-Free Diet? Good grain is actually beneficial to dogs. Dog parents are deluged with reports and Internet ads proclaiming that grain-free is the way to go. Perhaps in some cases, it is. With the Merrick Classic dog food line, chia seeds are included. Yes, yes, and more yes. I eat chia: Dogs can now eat chia if properly prepared, as Merrick does. Do not confuse this chia seed with what you see growing out of those funny pets on television. 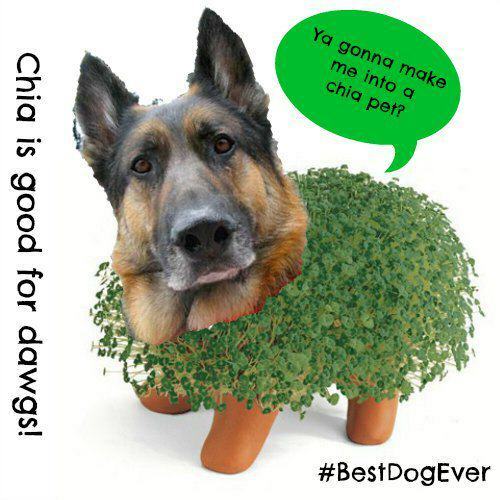 Our pals at Tripawds say that their three-legged dog, Wyatt, allowed this fun by morphing into a chia pet; pretty funny, right? Chia seeds contain fatty acids, and fatty acids contribute to a healthy coat. See where we are going? 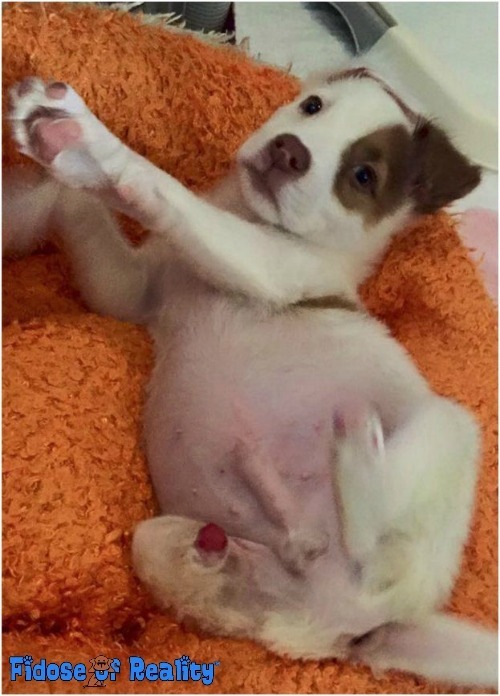 How paw-some does Baby Joey look thanks to a loving foster mom, TLC, and a diet from Merrick Classic? Speaking of fatty acids, there are increased Omega 3 levels in this line of dog food. Omega 3’s are another trendy fatty acid..and dogs benefit in a variety of ways from them. Omega fatty acids are broken down into three, six, and nine categories. Omega three and nine fatty acids are considered to be anti-inflammatory while Omega six fatty acids can be pro-inflammatory. Omega three fatty acids can be beneficial for skin, joints, nerves, or having any condition associated with inflammation (skin allergies, immune-mediated diseases, arthritis, cancer, etc.). Baby Joey has no idea the goodness that is going on inside his body to help support his skeleton and outer structures, and he loves when his foster dog mom gives the signal to chow down, see? Should My Dog Try Merrick Classic Dog Food? Think your BestDogEver would like to try new & improved Merrick Classic recipes? 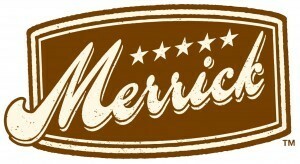 Merrick is giving away 50 bags to 50 lucky dogs on their Facebook page!!! 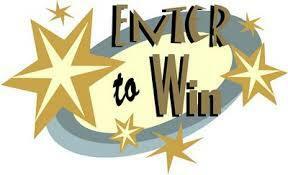 Click here to sign up for the opportunity to win! 50 winners will receive one small bag of Merrick Classic Recipe of their choice. Open to US and Canada only. This is a sponsored conversation written by me on behalf of Merrick. The opinions and text are all mine. Awww, look at him. What a truly amazing dog. Aw Baby Joey is a cutie. I like that he is making great progress. I love Merrick and their rep Betsy is so sweet! I’m glad Joey is a survivor! ♥ There is a special place in hell for humans that hurt dogs. Aww, what a sweet baby. He is definitely a contender for best dog ever, just behind mine, LOL! That is great information about the dog food he eats! Ohhhh Baby Joey we are in LOVE with you! Welcome to the world of Tripawds, you for sure are an honorary member. And now that you’re a chia dog like our spokesdog Wyatt, the sky’s the limit…heh heh! Wyatt is doing really well on this food, but that’s no surprise to us, he does well on ALL of Merrick’s food, they’re our go-to brand. It’s nice that Merrick is pretty much everywhere because we travel so much. We always know we can find it and feed Wyatt the food he needs to be strong and healthy on 3. All the love to you Baby Joey (you too Carol!). 3-paws up! It makes me sick to my stomach to think that someone would do something that horrific to a puppy. He looks like he is thriving and has found a forever home that will give him all the love and attention he deserves! Sweet little fur baby. how does 60% poultry and fish proteins translate to only 30% protein? Wouldn’t it be 60% protein? I have two puppies so I would have to say they are both the #bestdogever! Wyatt is a cuddle bug and Max is a big ball of fun. We are cat lovers…but out cats do eat Merrick canned cat food. Baby Joey is too cute! 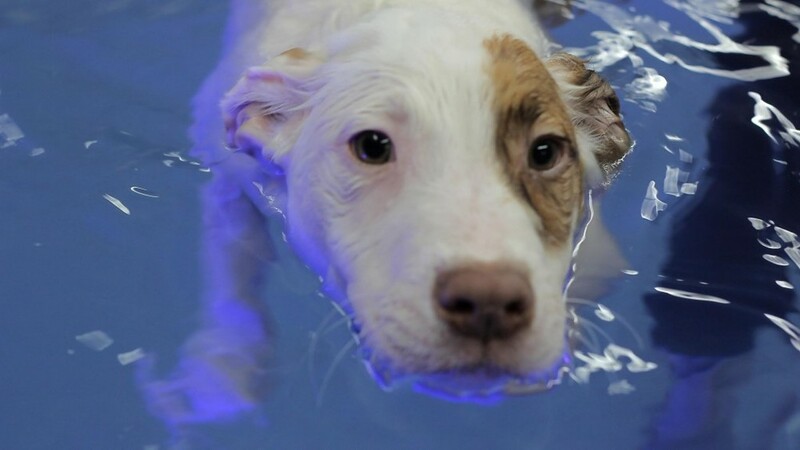 The picture of him swimming for rehab is adorable. Does Joey have a new ear? Did they ever arrest who assaulted him? How cute! Merrick sounds like a really good dog food. We haven’t tried whole grain dog food before. Oh, these pictures are adorable. Every dog deserves the title of Best Dog Ever! What an amazing puppy! I can’t believe anyone could harm an innocent animal like that! i have seen this story b4, it makes me sick that people can do such horrific things to animals, and they never get punished. i like the merrick canned foods. i always keep some canned food in emergency. when the dogs have their teeth cleaned or the youngest decides she does not like her food that dog. one day she likes her food and the next she does not. but she will always eat canned foods. so i keep some on hand. It amazes me how people can be so mean to dogs. They are so sweet and loving! I am glad that Joey was able to get the care needed. Awww need tissues!! Such a sweet dog, so precious! 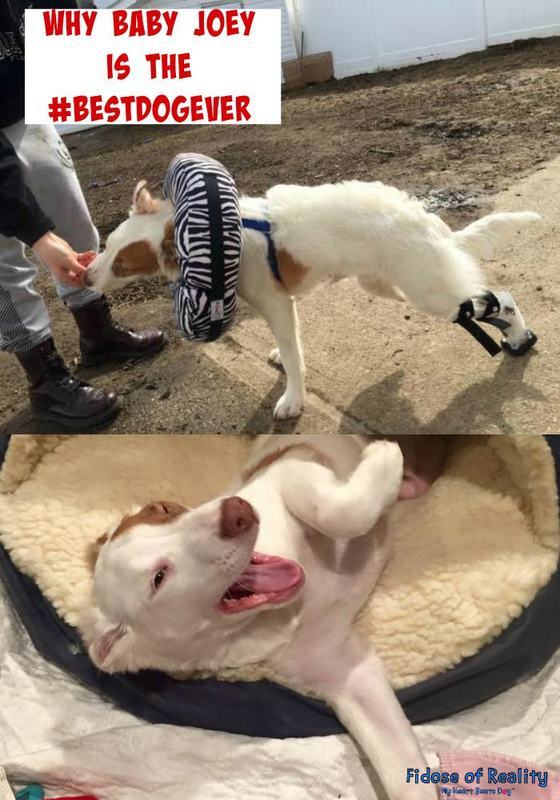 Aww, glad to hear Baby Joey is making progress with his recovery! Looks like such an amazing dog! I’m glad someone glad someone helped him. He’s so cute.